This latest 1/48 upgrade set from Barracuda Studios is for the recent Airfix 1/48 Sea Fury. 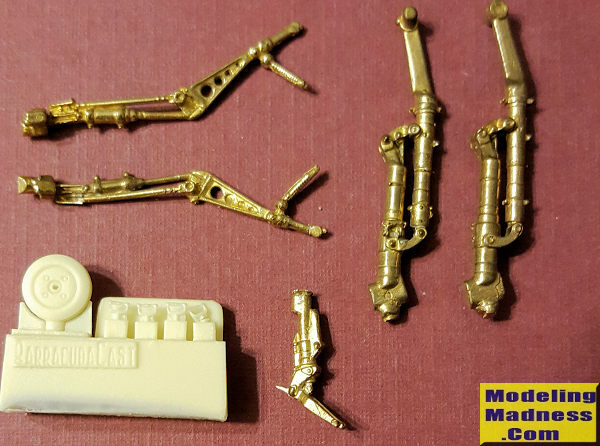 This landing gear set is mostly in brass. Brass has the benefit of a bit crisper molding and more strength than white metal. It also means that it is a bit more difficult to remove mold seams and to drill. The set has the main landing gear and retraction assemblies as well as the tail strut in brass. The small D rings and tail wheel are in resin. This set may well be usable on other 1/48 Sea Fury kits, but no guarantees as it wasn't designed for them.